Kastela Fortress is one of Portuguese heritage fortress that located on fortress Kastela Santo Paulo Highway, Kastela village, Pulau Ternate district, Ternate city. The location of this fort is in the north. Kastela Fortress is also commonly called Gam Lamo Fortress, which is the designation of Mount Gamalama. The fortress was built by Antonio de Brito in 1521 under the name of Nostra Senora del Rosario. It was built in stages followed by Garcia Henriques in 1525 and it continued by Gonzalo Periera until finally resolved by Jorge de Gastro in 1540. When entered into the castle, we will welcomed by a monument as a welcome greeting with a huge cloves statue. Looking further into the place there is a relief that describing the killing of Sultan Khaerun. According to the record history, after Malaka defeated by Portuguese in 1511, Admiral Alfonso d’Alburquerque was sending Antonio de Abreu and Fransico Serrao to Maluku with three ships battalion in December 1511. During January 1512, they arrived at Banda. Fransisco Serrao was the first Portuguese functionaries that succeed to negotiate the rights of monopoly from his country to the spices trading and exclusive rights from the development of this Portuguese fort in Gamlamo. This fort was built on stages within 20 years. 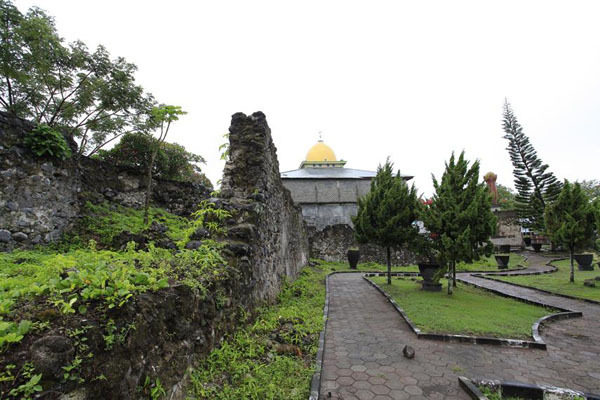 Until 1569, Gamlamo fort was the only one fort that standing still at outside Malaka, after that year there are other forts in Ambon, Jailolo, Moro, Banda and Makassar. On February 27, 1570 there was tragic murdered of Sultan Khairun Jamil at this place by Antonio Pimental for the order of Diego Lopez de Mesquita, the 18th Portuguese Governor. After the death of the Sultan, the Prince gave an order to sue Diego Lopez de Mesquita for the murder but the Portuguese denied the sue. That denied made war from Ternate People and they lock up the fort for 4 years (1574-1578) and gave ultimatum for Portuguese to step away from Ternate. Right after that tragedy, there was huge evacuation of Portuguese from Ternate that moved away to Tidore and Goa.